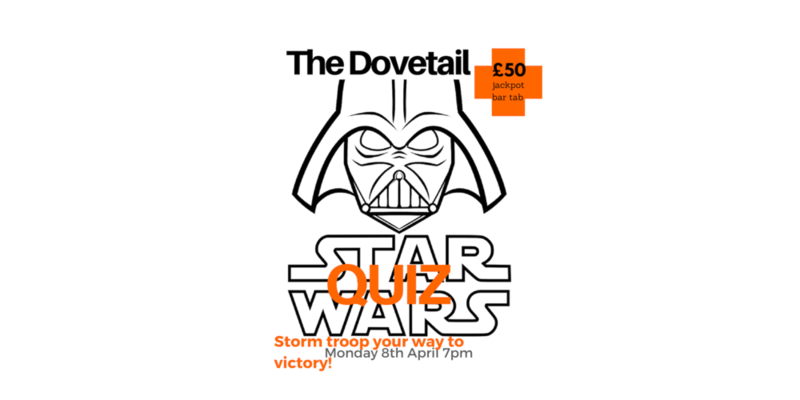 Star Wars Quiz extravaganza. £50 bar tab Jackpot. Join us for our next out of this world themed quiz. Devised by the lovely Nathan expect to be challenged and entertained in equal measure. Who is the lead singer of Jabba the Hutt’s house band? Complete the line "thats no moon; its a....... "
Feel free to dress up and get into the spirit of the occaision. Themed drinks and offers on the night. Places are limited due to our size so book your team in or miss out on what will be a night to remember. £20 for team of up to 6 or £5 per ticket. Massive £50 bar tab jackpot for winning team.